BenQ W2000 review | What Hi-Fi? There was a time when, if you weren’t thinking of spending upwards of £2000 on a projector, we’d have told you to proceed with caution. 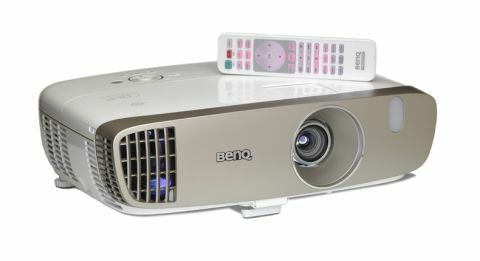 But things are changing, and no more so than with BenQ’s W2000 projector. The W2000 is a Full HD single-chip DLP projector, and boasts BenQ’s CinematicColour technology, which aims to deliver the full Rec.709 colour standard for HD images. This should mean more accurate colours straight out of the box. It’s a compact, lightweight projector, neatly designed with gently curved edges and a mostly white plastic body, save for a flourish of gold along the front edge. There are some top-mounted controls for when you don’t have the included backlit remote to hand, with all inputs placed on the back panel. These are covered by two HDMI inputs, one each of composite and component video, RCA audio ins, a 3.5mm audio loop, a D-Sub PC port and an RS-232 port for control. There are also standard and mini USB ports but the latter is for servicing and the former for connecting up BenQ’s optional wireless HD kit for wireless streaming – you can’t connect any external hard drives for media playback. The W2000 delivers colour via a 6x speed RGBRGB colour wheel, specially coated and angled to help achieve that Rec.709 standard. With HDR now causing waves among the AV crowd, this might feel a little late in the day. But it’s still the standard for Blu-ray and very much welcome, especially at this price. Set-up is relatively straightforward, with twist-to-extend feet at the back and a pop out foot at the front to help you to position the picture correctly. It’s a relatively short-throw projector, allowing for a picture of up to 100in from 2.5m away. With just a 1.3x zoom on board, you’ll want it a little closer to get a decently-sized picture – we placed it on a coffee table in front of our viewing position rather than on our AV rack behind to get the desired picture size for our 96in screen. We hook it up to our amp and surround sound system, but the BenQ also comes with a pair of stereo speakers around the back, driven by 20W of amplification. While we would recommend that you don’t use them as your main speakers, they actually go decently loud for their size, offering a pretty solid midrange that makes dialogue clear and easily heard above a soundtrack. That said, they do harden up in the top end at the higher volumes and offer very little by way of bass or definition. It’s still pretty obvious that the sound is coming from the projector and not your screen too. We use the W2000’s built-in test pattern to get things in position, using the manual focus, zoom and vertical image shifting controls tucked away under a sliding panel on the top. We select the Cinema Rec.709 picture mode from the settings, which as expected, is pretty much spot on in terms of picture and needs just a few tweaks to brightness and contrast using the THX test disc as our guide. If you wish, the W2000 is also ISF certified for pro calibration, but that does seem a little over the top for this price point. Alternatively, there are ISF presets for day and night, alongside ‘bright’, ‘vivid’ and a handful of others – we found ‘cinema’ the most natural and accurate. We set the lamp to ‘normal’ – you can also opt for ‘eco’ or ‘smart eco’ (a sort of dynamic contrast setting that will adjust itself based on the content on screen) but we find normal the best for performance. At 2000 ANSI lumens max brightness, we’ve still seen brighter pictures, but the W2000 goes for colour accuracy above all else. And it absolutely succeeds. Watch a Blu-ray of Spectre and the W2000 immediately shows off its excellent ability with colour, balancing skin tones masterfully and really picking out the subtle differences in shade. Nothing is ever overblown or overdone – it’s superbly balanced for a projector of this price, of which lesser ones might push colour saturation up to achieve a punchier, but less natural picture. It handles depth really nicely, so images appear layered – buildings appear to stand in front of one another and textures have a great sense of realism. It makes for a wholly immersive picture that is only complemented by its superb handling of colour. That said, it’s not the last word in sharpness and detail. There’s just a touch of softness here compared to what you’d find in slightly pricier models, which means subtler detail in faces and clothing can be overlooked or smoothed over. For its price it’s still decent though, and it manages to avoid excessive picture noise as a result – a pay off we’re happy to take at this level. However, where it does fall short is in its black levels. It’s most noticeable in murkier scenes, where it just doesn’t manage to get as deep as we’d like, leaving things looking a little washed out, which in turn affects shadow detail too. For example in a night setting, Bond’s black suit jacket looks more like a single flat black outline, missing out on the creases and details you’d see with a more talented projector. You can push up brightness to help here, but we wouldn’t advise it – it’ll only have a knock-on effect to black levels and make them appear even cloudier. Motion can be a bit of a mixed bag too. When Bond goes by boat to visit Q, the water on the Thames moves smoothly past the boat and out of shot, but more solid lines – like those of the buildings in the background – can cause a touch of judder. Luckily, it’s minimal enough that it doesn’t take much away from the overall picture. While 3D may be dead and buried according to some TV manufacturers, BenQ has included it in the active flavour here, and to good effect. Watch Life of Pi in 3D and images are sharp, with colours as well balanced as they are in 2D. The W2000’s good handling of depth only adds to its ability here too, giving a very natural, realistic picture, which doesn’t strain our eyes. It’s relatively stable too, with little sign of crosstalk during our testing. The only catch? You’ll need to buy the glasses to go with it, as they aren’t included in the box. Overall, the BenQ W2000 packs a real punch for its price, with a natural colour palette and wholly immersive picture that will be a treat for those wanting the big cinema experience on a budget. We’d like black levels and shadow detail to be a touch better in dark scenes though – even at this level it feels lacking – but while we have to dock it a star for that, it shouldn’t put you off giving the W2000 an audition. It’s a very likeable budget projector indeed.